Say hello to our gorgeous designer of the week, Caroline Matthews, who we caught up with this week. Born and raised in Leeds, Caroline graduated from Leeds College of Art and Design in 1996. She worked for numerous fashion houses before launching her own bridal collection in 2005 under the name Caroline Atelier. Her dresses are just stunning for contemporary brides wanting something completely different and all are designed and sewn using high quality silk, satins and embellishments. The first dress shown here is Emmy, which Caroline told us is her favourite,”it was the dress that started my career in Ireland and has made brides all over look amazing. It’s one of my best-selling dresses both in the UK and Ireland and the one I am most known for. This dress put me on the bridal scene for brides that wanted something different to the normal dresses available, whilst also offering the feature of being backless. Wedding guests tend to spend the whole ceremony looking at a brides back, so why not make it as beautiful and ornate as the front! 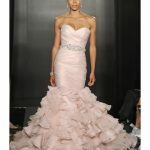 I also won Best New Contemporary Designer with Irish Brides Magazine for this dress, so it’s very special to me”. The next two dresses that Caroline has shared with us are part of her new collection. We asked her what her design style is and how this inspires her designs. “Everything inspires me”, says Caroline, “from nature, to the Golden Globes and day-to-day things! It’s great to be in an environment where you can be inspired everyday! My designs feature heavily on Art deco inspiration as well as my signature style of backless dresses. I try to combine the Hollywood glamour that us girls are looking for, whilst still retaining the look and feel of a wedding dress”. Image below: Bling, part of the new collection. Thanks to Caroline for taking the time to share some of her dresses and the inspiration behind them with us. 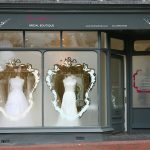 If you would like to see her designs for yourself then please make an appointment with Kent bridal shop, Isabella Grace, or visit Caroline’s website for contact information.